This entry was posted on 23rd March, 2011 by Haxnicks. Amateur Gardening Magazine is a definite Haxnicks' fave with all of us here, and with offices in Poole, Dorset - not too far away either. 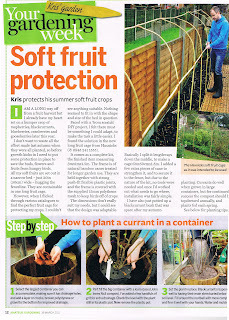 Gardening editor Kris Collins with our fruit cage sawn in half!! Ok, on closer inspection, we noticed that he hadn't butchered our beloved long fruit cage, only created a brand new 6m one from the 3m long original! Our cages are incredibly versatile, lightweight and easy to manipulate, and Kris has proved this brilliantly. So that made us think - what can you make with yours? Read the instructions that are included for ideas, and then send in photos of your creations. You're guaranteed to appear in our customer's photos album, and you may even win a prize! Fruit Cages are available now in most garden centres and online! Thank you very much - please subscribe or 'follow' us if you would like updates straight to your inbox.